The Spanish Inheritance Law or Probate Law is a legal process that takes place after someone’s death. It usually involves proving that the deceased’s will is valid, identifying and appraising (taxation) the deceased person’s properties and paying outstanding debts plus taxes. After this procedure the total property will be distributed over the legal heirs per existing will or per applicable law. 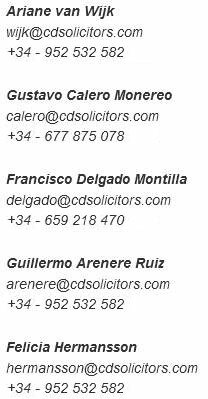 Our law firm renders a comprehensive counselling for granting of probate procedures, whether the deceased made a will in Spain or whether the deceased only made a will in his or her country of origin or even if a will was never made. The lawyers of C&D Solicitors will deal with the processing and signature (through a power of attorney) of all necessary documentation and payment of legal expenses resulting from this processing, until the distribution to the heirs of the estate given by the deceased. C&D Solicitors also renders legal counselling for drafting the most suitable last will and testament fitting your personal situation, so that your heirs may receive their inherited property as soon as possible and after payment of the lowest possible expenses plus taxes.For example, for most foreigners (residents or non-residents) with a house or other real estate in Spain it´s favourable to have Spanish will which states their choice for their personal (national) law to apply in case of death. The Inheritance Tax in force in Spain is administrated by Spanish Regional Governments.Currently, in Andalusia several tax rebates are applicable for the inheritance tax. These are implemented depending on the testator’s fiscal resident or non-resident situation in Andalusia in the last years, as well as the estate value to be given and the heirs’ pre-existing estate. Therefore, a correct tax planning is important with respect to the peculiarities of each case, so that the taxpayer’s taxation for this Inheritance Tax may not be so costly. C&D Solicitors analyses and calculates the various scenarios in order to offer you the best legal and tax counselling.